December has been typical. The frantic run up to Christmas Day that starts early in November, if not before, and then all the fun and excitement of the holiday, then before you can look around it is over. This time of year is always a marker in the chronology of the year and it emphasises the speed at which our lives go by. The beginning of 2003 seems as though it had only just happened and then we are celebrating the arrival of 2004. We went to see Master and Commander at the beginning of the month. We hoped it would be a realistic view of the hard times spent serving on a British Navy Ship at the time of Nelson and as always Steve was absorbed by the film, Jane noted that the clothes at all times were too clean and the sailors were overweight and healthy looking. That aside the battle scenes were exciting and reasonably authentic to the extent that many of the injured were wounded by splintering wood. 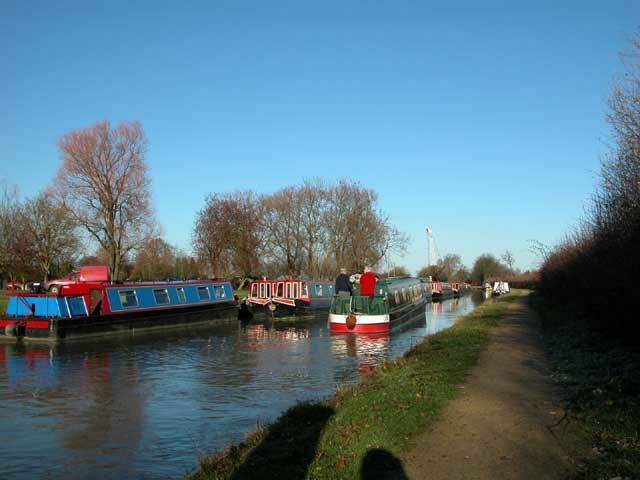 In early December we had time at the weekends to get out for some walks alongside the canal. The days had clear skies and the bright colours of the canal barges stood out beautifully. Some people were taking a late opportunity to move their boats along the canal and undertake some spring cleaning. Prior to this Jane had been feeding the ducks and they had been taking her bread with great enthusiasm. During the summer we are so busy with the garden and ballooning that we don't get the opportunity to go for walks. 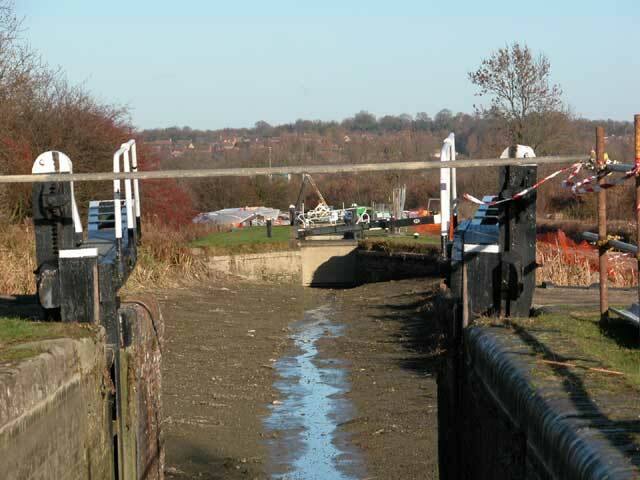 British Waterways were taking advantage of the winter months to undertake repairs to the Rothersthorpe flight of locks on the Northampton Arm of the Grand Union Canal. This meant draining the locks. The work has entailed re-bricking the sluice runs that act as overflows when the lock is full. They were also building a new wooden bridge in line with the footpath we take between Rothersthorpe and East Hunsbury. The contractor, Nuttals, told us the work was to be completed and the site cleared the weekend before Christmas but there are still compressors on site on New Years day and this lock remains empty. 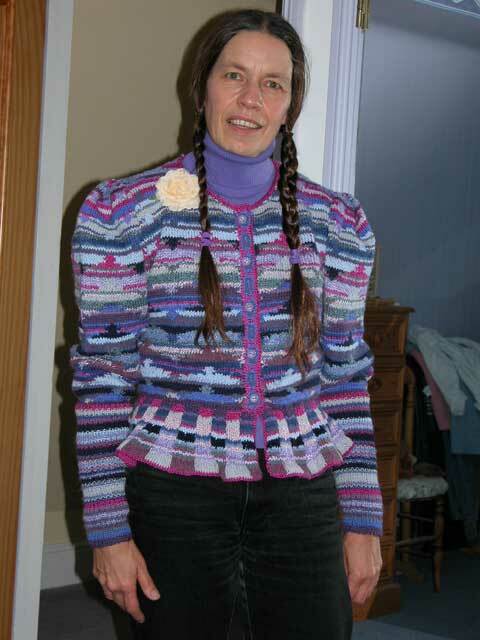 We had a whole load of Christmas presents, more than we deserved and some, like this jumper Jane is wearing, were created by hand with a great deal of love. In our existence there is very little that we want and we regard ourselves as very fortunate for the health, wealth and happiness we have so Christmas is much more about giving than receiving. 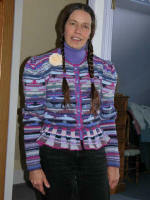 Jane is a great giver and she takes pleasure in finding the appropriate presents for our friends and family. As time goes on the prospect of Amazon's wish list becomes more and more attractive. This gives an opportunity to say exactly what you want and with so much to choose from it's possible to include something that everyone could afford. It helps the giver to find the right present and the receiver gets something that they want, what could be better, a win/win situation. The present giving and receiving went on for several days as relatives and friends dropped by through the holiday period. 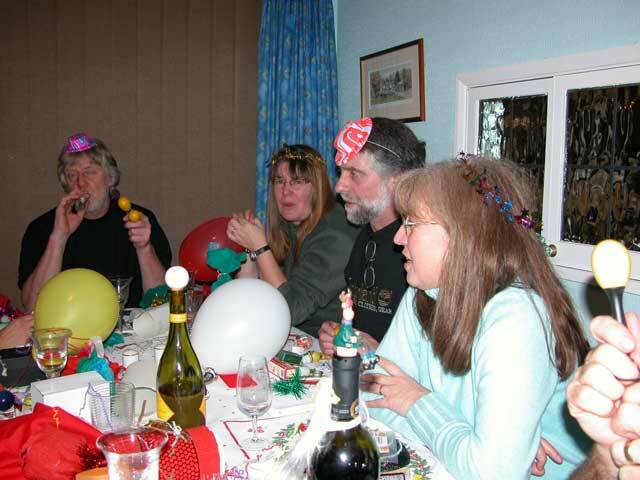 Christmas day was enjoyed by everybody who attended Dave & Lucie's East Hunsbury home. There were ten of us in all and we played, talked and laughed all afternoon and late into the night. We had a great time with our closest friends and it was one of those times which you hope will never end. We walked across the fields to East Hunsbury during the early afternoon and staggered back using the same footpath after 23:00. The torch was bright for the first 30 minutes but just when we needed it most the beam dimmed and we found ourselves in muddy conditions in the dark. It was an adventure to end the day but not flatten our spirits.